Photo 1: The women's single finalist, American Jamie Hampton. Jamie came just short in the women's doubles final as well. She and her partner, Noppawan Lertcheewakarn, lost to Karolina and Kristyna Pliskova of Czech Republic, 5-7, 6-2, 10-2. Photo 2: British number two James Ward beat American Robby Ginepri 7-5, 6-4 to win the men's title. The 24-year-old pushed his ranking up 30 places to number 144. James reached his first ATP semi-final at Queen's Club earlier in June. Photo 3: Men's finalist, American Robby Ginepri. Like 2009 men's winner Marcos Baghdatis of Cyprus, Robby is on the comeback trail from injury. The former world No. 15 player is recovering from an injury in a mountain bike crash. He is getting ready for the upcoming U.S. Open. Photo 4: American Travis Parrott and his wife. Travis and partner, Treat Conrad Huey of Philippine, are this year's Men's Doubles Champions. Photo 5: The Men's Doubles runner-up, Australian Jordan Kerr, left, and American David Martin. Photo 7: Fashion show for players and tennis fans. Models lined up to show of their tennis wares and receive the cheers of the appreciative audience! Photo 8: Qualifying round: BC's Daniel Chu came short to advance to the main draw, losing to Slovenia's Luka Gregorc 6-2, 6-1 in the final round of qualifying. Luka advanced to the main draw but lost to the second-seed Bobby Reynolds of the U.S. in the round of 16, 6-4, 4-6, 6-2. Henry Choi and George Jecminek were the only other BC players who won their first match. Photo 9: Find your beach! Jake Weston, left, and Sam Gouneili are taking a break between their shifts as ball-boys at sponsor Corona's hospitality stand. Thanks to Peter Grimsey for organizing 60 to 70 ball-kids for the tournament. 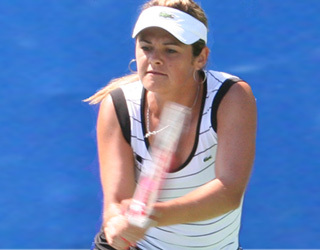 Jake's dad, John Weston, Member of Parliament for West Vancouver and Sunshine Coast, was spotted in the crowd cheering Aleksandra Wozniak in her Women's finalist win Sunday. Men's top seed Yen-Hsun Lu of Taiwan was upset by Alex Bogdanovic of Britain in the second round.